Carte de l'Egypte Ancienne et Moderne, dressee sur celle du R.P. Sicard et autres, assujetties aux observations astronomiques. 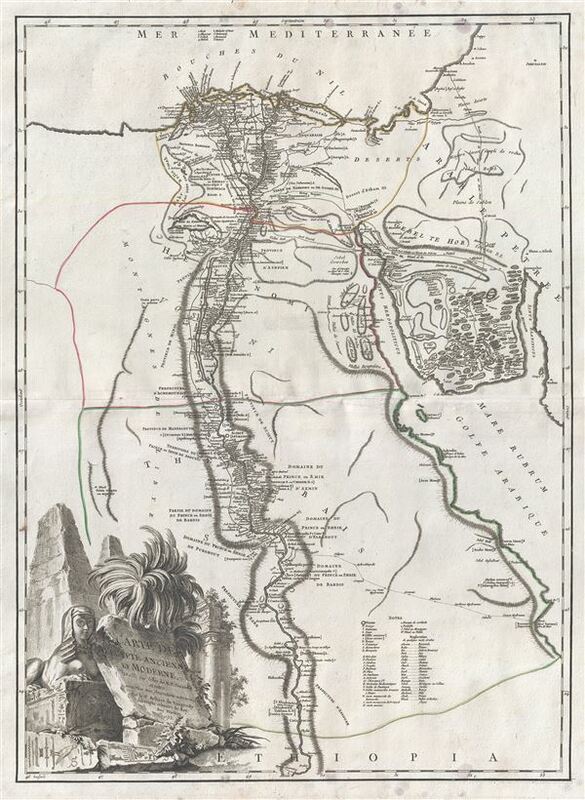 This is an exceptional 1753 map of Egypt by Rober de Vaugondy. Centered in the Nile River Delta, the map covers Egypt and part of the Red Sea. Details various Sheikdoms, Prefectures and Provinces throughout along with several ancient towns and oases along the Nile. The important ancient caravan route from the Red Sea port of Berenice to Coptos (Qift) is noted. The pyramids near Memphis are also identified. Several other important towns, mountains, rivers and other topographical details are noted. Several archeological surveys have been undertaken to unearth the labyrinth, but so far no findings have been confirmed. A highly decorative title cartouche depicting a sphinx and pyramids appears in the bottom left quadrant. Drawn by Robert de Vaugondy and published in the 1757 issue of his Atlas Universal. The Atlas Universal was one of the first atlases based upon actual surveys. Therefore, this map is highly accurate (for the period) and has most contemporary town names correct, though historic names are, in many cases, incorrect or omitted. Very good. Minor wear along original centerfold. Original platemark visible. Some spotting and mold stains near top and bottom margins. Rumsey 3353.097. Pedley, Mary Sponberg Belle et Utile: The Work of the Robert de Vaugondy Family of Mapmakers, 431.